Right now, there are thousands of positions open in the health care industry that need to be filled. The problem is – not many people know the jobs are open. There are thousands of positions open in the health care industry right now that need to be filled. The problem is not many people know the jobs are open. So the organization, Greater Metro Denver Healthcare Partnership (GMDHP), has started a new effort to help make sure people know about their options. Many people believe working in health care requires several years of schooling. That’s true for some positions, but it leaves a lot of holes in that industry. “Every year, there’s 4,500 different positions that go unfulfilled because there’s not enough people,” said Jeana Capel-Jones, the program manager for GMDHP. 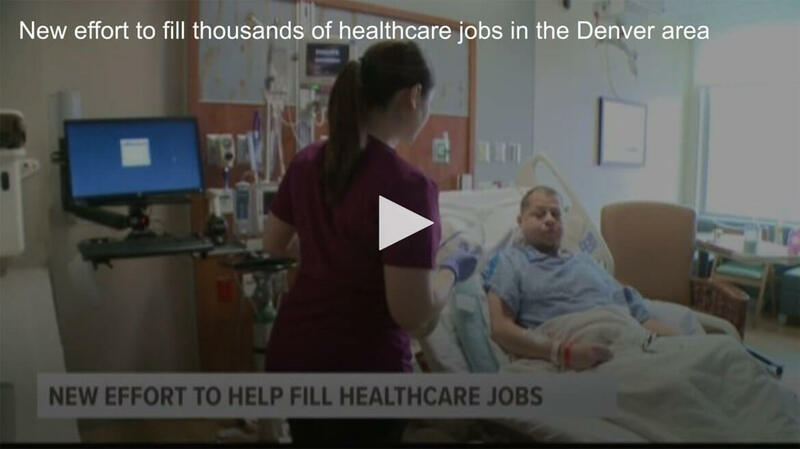 Lindsey Martinez, a patient care technician at Saint Joseph’s Hospital (St. Joe’s) in Denver, is one of those people. Lindsey wasn’t always tending to patients. “I was working at sports authority and they said ‘well, we’re going to close half the stores down’ and I needed a new job,” said Martinez. After applying for a few different positions at St. Joe’s, she ended up in the hospital’s kitchen. But that job turned into a career because of a new initiative launched by GMDHP. Martinez learned she could become a certified nursing assistant right there at St. Joe’s. The partnership’s new campaign aims to raise awareness about those positions that often just need training and not college degrees. “A lot of the occupations that we’re addressing right now really take only six months to two years to complete,” Capel-Jones said. It was something that never crossed Martinez’s mind. With a growing need for workers across the board, the partnership hopes their new effort will set health care ahead. “There’s a war on talent right now. It doesn’t matter if you’re in healthcare or construction or retail – everybody needs people,” said Capel-Jones. There are five positions with the highest need – nurses’ aides, medical assistants, medical lab technicians, pharmacy techs and surgical techs. The GMDHP has a website that acts as a central hub for the healthcare professions and programs available in the Denver area. You can access that website here.